Treatment of children with profound sensori-neural hearing loss (SNHL) has been influenced by diagnostic improvements and technological treatment advances, specifically new cochlear implant prospects recently. Nowadays, multiple handicaped children and children with syndromes and conditions resulting disabilities such as dual sensory loss, brain segmental dysplasia, cerebral palsy, global developmental delay and autistic spectrum disorder are not routinely precluded from receiving a cochlear implant. , Developing technical facilities and increasing experiences has led more challenging cases are candidates for cochlear implantation (CI). Neuronal migration disorders (NMD) is a diverse group of the human brain malformations that primarily affect the development of the cerebral cortex. Corpus callosum agenesis, lissencephaly, pachygyria, heterotopias, schizencephaly, holoprosencephaly, polymicrogyria and etc., are forms of brain anomalies in NMD. Multiple additional handicaps such as SNHL and motor developmental delay (MDD) may be seen in these patients and they need several special care. Theoretically, CI should be effective in these patients although it did not try formerly. We present an 8-month-old female infant who was referred to Baqiyatallah cochlear implant center due to bilateral profound SNHL diagnosed by otoacoustic emissions test. In past medical history, she was a product of non-consanguineous marriage without any family history of SNHL and mental or MDD, who was born by cesarean section after an uneventful pregnancy with gestational age of 34 weeks and birth weight of 2250 g. Phototherapy was performed due to mild hyperbilirubinemia during the hospitalization. Regarding to profound SNHL, cochlear implants were offered to her parents. Her evaluation showed MDD based on denver developmental screening test-II. She could not sit without the support and a mild spasticity was detected in her left extremities, her mental and cognitive development was relevant to her age. Brain magnetic resonance imaging was revealed pachygyria and marked abnormal gyration in right temporoparietal lobe, associated white matter volume loss was present in the obtained coronal T1 images. In Axial T2 section, small microgyria in the frontal lobe supplemented by pachygyria and double band sign was seen [Figure 1]. The entire above are compatible with NMD. Serum and urine evaluation for inborn errors of metabolism (such as amino acids chromatography, Lactate and Ammonia) were normal. Thyroid function tests and venous blood gas analysis were in normal ranges. Cytomegalovirus antibody immunoglobulin (Ig) G and IgM was not reactive. Then, she was referred to a rehabilitation center for physical and occupational therapy with the impression of cerebral palsy. The second visit was done after 4 months of rehabilitation, she had acquired sitting skill at 10 months of age, but could not stand independently, her left upper limb and two lower limbs were spastic. Therefore, the rehabilitation therapy was continued until she started walking independently in 2 years of age, although the tonicity of her left limbs was increased and she had left side tiptoe walking. At this age, she referred for CI and at the post operation follow-up she did not show any CI related complication. Hearing ability was evaluated by the categories of auditory perception (CAP) scale and speech ability was assessed by speech intelligibility ratings (SIR). At 12 months post-operative assessment, the patient, who had 0 score in CAP (no awareness of environmental sounds) at baseline, progressed to category 5 (understanding of common phrases without lip-reading). 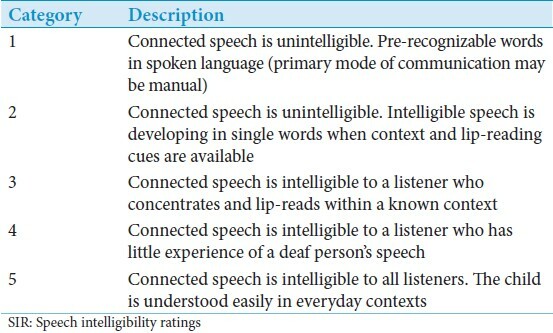 In addition, the patient SIR score was increased from category 1 (connected speech is unintelligible) pre-operatively to category 4 (connected speech is intelligible to a listener who has little experience of a deaf person's speech) [Table 1] and [Table 2]. At the last follow-up visit in 24 months after implantation, her neurological and developmental condition was appropriate. Almost all patients with a form of NMD are severely neurologically impaired. This neurologic impairment could be involved sensory impairment such as auditory perception disorder however; SNHL of varying severity is not always present. , Furthermore, regarding to brain structural malformation the patients may be affected by motor neuronal defects. Children with or without genetically based disorders may be affected by SNHL accompanying NMD. Patients with several handicaps are responsible for a small percentage of implanters in a CI schedule because they remain the most challenging cases for which to predict profit from the CI and post-operative rehabilitation. Based on our knowledge, for the first time, we report a child with NMD and profound bilateral SNHL that underwent CI and her auditory perception and speech intelligibility progressed properly. CI could be an effective option for children with SNHL and neurologic developmental disorders. 1. Amirsalari S, Yousefi J, Radfar S, Saburi A, Tavallaie SA, Hosseini MJ, et al. Cochlear implant outcomes in children with motor developmental delay. Int J Pediatr Otorhinolaryngol 2012;76:100-3. 2. Najafiyan B, Saburi A, Amirsalari S. Report of cochlear implantation outcome in a case of Waardenburg syndrome. Int J Pediatr Otorhinolaryngol 2012;76:761. 3. Amirsalari S, Ajallouyean M, Saburi A, Haddadi Fard A, Abed M, Ghazavi Y. Cochlear implantation outcomes in children with Waardenburg syndrome. Eur Arch Otorhinolaryngol 2012;269:2179-83. 4. Koul RL, Alfuitasi AM, Sankhla DK, Javad H, William RR. Pattern of childhood neuronal migrational disorders in Oman. Neurosciences (Riyadh) 2009;14:158-62. 5. Hallioglu O, Topaloglu AK, Zenciroglu A, Duzovali O, Yilgor E, Saribas S. Denver developmental screening test II for early identification of the infants who will develop major neurological deficit as a sequalea of hypoxic-ischemic encephalopathy. Pediatr Int 2001;43:400-4. 6. Lejeune B, Demanez L. Speech discrimination and intelligibility: Outcome of deaf children fitted with hearing aids or cochlear implants. B-ENT 2006;2:63-8. 7. Howard MA, Rodenas-Ruano A, Henkemeyer M, Martin GK, Lonsbury-Martin BL, Liebl DJ. Eph receptor deficiencies lead to altered cochlear function. Hear Res 2003;178:118-30. 8. Muto M, Wang H. Neuronal migration anomalies. The magnetic resonance aspects of some types. Radiol Med 1992;84:532-5. 9. Varghese AM, Mathew J, Alexander A, Thenmozhi K, Evangelin GL, Kurien M. Bilateral simultaneous cochlear implantation in children: Report of a case and review of literature. Indian J Otolaryngol Head Neck Surg 2012;64:95-6.